We built the sites listed below for our clients, and we would love to do the same for you. Some of these sites are still under construction, but they should provide a solid display of our capabilities. 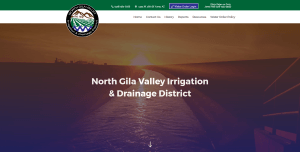 Currently under development, the North Gila Valley Irrigation and Drainage District website will feature gorgeous video and images of Yuma, along with useful information about the district. SMILE is an not-for-profit organization in Yuma, AZ dedicated to empowering individuals with disabilities to maximize independence. This site was custom designed and donated to SMILE, and was created to be visually appealing and accessible to those with visual and other impairments. We designed our site, too, of course. Noble Law Office is the premier water rights law firm in Yuma, AZ. This site was designed to have a clean, professional look. Yuma County Agriculture Water Coalition ties together the various irrigation and drainage districts, farmers, legal counsel, and other interested parties in the Yuma area on the common cause of water. The site contains presentations on water rights and usage, and also provides contact information for those interested in learning more about water issues. We’re great at identifying, customizing, and installing existing web app technologies and Wordpress Plugins that are useful and save clients, but we’re also experts in creating powerful apps from scratch. The projects below are just a taste of the projects we have developed over the years. We use industry standard web app frameworks like Django and Node.js to create functional tools that connect and empower. 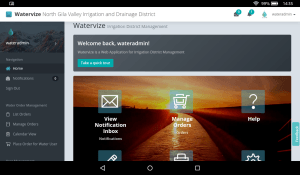 Watervize is a web app providing a full-featured set of tools for irrigation districts, including online water orders, district scheduling, order management, reporting, a customer information portal, and more. It enables modernization and improvements in efficiency and accuracy for even small and medium districts.